Your local grocers may not be entirely motivated by concern for the environment when they urge you to bring cloth bags to carry home your purchases. It turns out that plastic bags cost nearly two cents each. The useful, versatile paper bags (let me reveal my bias early) cost a nickel each. 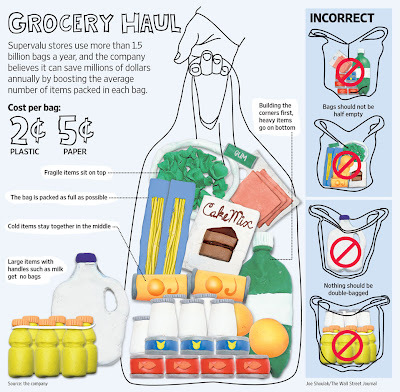 These figures were revealed this week in a Wall Street Journal article explaining how Supervalu (the company that runs the Jewel chain here in Chicago) is training its employees to use fewer bags when packing groceries. The WSJ article even had this handy chart showing how things are to be done. It turns out that those pennies and nickels add up: Since Supervalu initiated these changes in mid-2009, the linked Journal article says, "it has boosted its average items per bag about 5%, saving $4 million to $6 million annually even as prices for plastic bags have climbed." 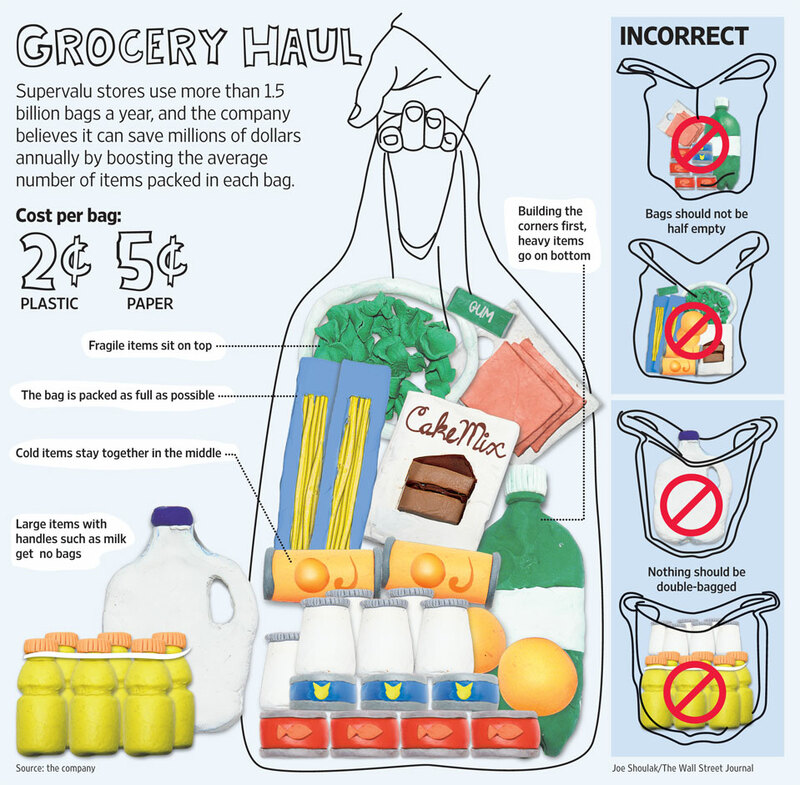 Baggers at grocery stores have been automatically using plastic instead of paper for some time unless the customer asks quickly (as the Journal article confirms) -- but I'm not sure why. Both paper and plastic bags can be recycled but, in a landfill, plastic is forever. According to Wikipedia, plastic bags are "often made from polyethylene, which consists of long chains of ethylene monomers. Ethylene is derived from natural gas and petroleum." Most plastic bags, Wikipedia says, are somehow derived from natural gas, not petroleum. But plastic bags still come from fossil fuels; paper bags come from trees, a renewable resource. And are plastic bags really cheaper than paper bags? If the customer is taking home only an item or two, the smaller, cheaper bag may be more cost-effective than a paper bag. But many more items can be packed into a paper bag than a typical grocery store plastic bag. So, on larger orders, is there a cost advantage? Cloth bags make the best economic sense for the grocers, but these only make environmental sense for customers up to a point. Paper bags can be used instead of plastic trash bags in the home for household garbage. Newspapers can be stacked neatly inside of paper bags while they wait for a trip to the recycling bin. Even old plastic bags can have household uses. A lot of people wouldn't be able to walk their dogs without them. To be as "green" as possible, bring cloth bags to the store -- but not so many that you don't get a few paper (or, I suppose, plastic) bags for household needs. In Goodman v. Ward, the Illinois Supreme Court today ruled that a candidate for a subcircuit judicial vacancy must be a resident of the subcircuit at the time he or she files for office. Chris Ward wanted to run for judge in the 4th Subcircuit of the 12th Judicial Circuit (Will County) in last year's primary. Ward was not a resident of that subcircuit when he filed his nomination papers and he did not misrepresent his address. He did, however, execute a Statement of Candidacy, required by law, in which he swore, "I am legally qualified to hold the office of Circuit Court Judge, 12th District [sic], 4th Judicial Subcircuit." But was he legally qualified? Ward's petitions were challenged by Daniel Goodman (whose wife, Carmen, was the only other aspirant for the Democratic nomination in that subcircuit) on the grounds that Ward was not eligible for office because he was not a resident of the subcircuit. Two members of the Will County electoral board, "mindful of the precept that ballot access should be favored," concluded that "that the governing provisions of the Illinois Constitution were 'arguably ambiguous and uncertain'" and that Ward should therefore be permitted to run (slip op. at 2). Goodman appealed. The Circuit Court agreed with Goodman, knocking Ward off the ballot. The Appellate Court also agreed with Goodman, though there was a dissent. The Illinois Supreme Court agreed to hear Ward's appeal, but not to expedite it. In the meantime, Carmen Goodman remained unopposed for the Democratic nomination. She defeated the Republican nominee in November of last year and took office in December. The Supreme Court stated, however, that it would decide Ward's appeal under the public interest exception to the mootness doctrine (slip op. at 4-5). The form’s language calls for a candidate to swear or affirm that, among other things, “I am legally qualified (including being the holder of any license that may be an eligibility requirement for the office I seek the nomination for) to hold such office ***.” (Emphasis added.) 10 ILCS 5/7–10 (West 2008). Because “am” indicates present tense and because the signed statement must accompany the nominating petition when it is filed, the statute can only be understood to mean that a candidate must meet the qualifications of office at the time he or she files a nomination petition with electoral authorities. No principle of English grammar or statutory construction permits an interpretation of the law which would allow candidates to defer meeting the qualifications of office until some later time. disregarded. This was a determination the electoral board had no authority to make." (Slip op. at 9-10). Some in the news media may be surprised by today's decision in Goodman v. Ward. After Maksym v. Board of Election Commissioners of City of Chicago, --- Ill.2d ---, --- N.E.2d --- (2011) (2011 WL 242421) -- the Rahm Emanuel case -- some may have imagined that a new age of relaxed ballot access had dawned. They may have actually believed that candidates will no longer have to worry about slick political operatives poring over stacks of petitions, looking for picayune or technical defects with which to knock good candidates off the ballot. But there should be no surprise. Barring major legislative reform of the State's election laws, prospective candidates remain well advised to seek competent counsel familiar with every twist and turn of ballot requirements. And keep in mind, too, that different ballot access rules apply to candidates for different offices. As the Supreme Court pointed out today (slip op. at 13), "No rule of law forbids states from imposing different eligibility requirements for membership in the different branches of its government, and no principle of legal reasoning permits an inference that the framers did not intend to do precisely that here." The increasingly popular Northwest Side Irish Parade today drew spirited demonstrations of support for each of the candidates in the upcoming 41st and 45th Ward Runoff Elections. 41st Ward Candidate Maurita E. Gavin's large group marched first along Northwest Highway. Not all of the candidates' supporters are of legal voting age -- or even human. That's an underage Gavin supporter above. At right is a picture of a little dog marching with the group supporting Gavin's opponent, 41st Ward Democratic Committeeman Mary E. O'Connor. Do not adjust the color on your monitor: Yes, that dog does indeed have a greenish tint. Presumably, this color scheme was adopted for the occasion. The runoff election is Tuesday, April 5. Early voting, however, starts Monday. For more pictures from today's parade, turn to page two. Associate Judge applicants: Have you heard from the Alliance yet? Per email received from the ISBA's Joyce Williams, who (among other things) coordinates the sending and receiving of judicial candidate questionnaires for the Alliance of Bar Associations for Judicial Screening: The Alliance has focused on reaching out to first-time applicants for Associate Judge in the current cycle. Some persons who've applied before might not yet have been contacted (full disclosure: I recently reached out to Ms. Williams for this very reason). Ms. Williams advises that, if an applicant has not yet heard from the Alliance, please send her an email at jwilliams@isba.org. She will provide you with the appropriate questionnaire.